After hours of furious debate, Knesset narrowly approve quasi-constitutional Basic Law, which critics say discriminates against Arabs and other minority communities. The Knesset overnight Wednesday passed into law the contentious nation-state bill that for the first time enshrines Israel as “the national home of the Jewish people” in its quasi-constitutional Basic Laws. 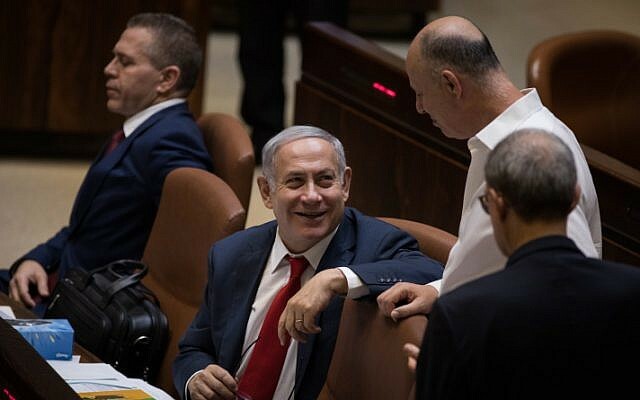 Lawmakers approved the bill in its second and third readings overnight, with 62 voting in favor, 55 opposed and two abstaining, after hours of heated debate in the Knesset chamber. Similar to a constitution, the Basic Laws underpin Israel’s legal system and are more difficult to repeal than regular laws. The nation-state bill, proponents say, puts Jewish values and democratic values on equal footing. Critics, however, say the law effectively discriminates against Israel’s Arabs and other minority communities. A resolution to “end complicity” in the occupation fails to garner support among the bishops, but a second resolution succeeds in establishing investment screening criteria for human rights abuses. We congratulate the Episcopal Church for joining its ecumenical partners in aligning its investments with its values and taking action for justice in Palestine. At its 79th general convening, the Episcopal Church considered several resolutions to support Palestinian rights, including multiple resolutions to take economic action. After 10 days of powerful organizing and lively debate, the Episcopal Church adopted six key resolutions affirming Palestinian rights, including resolution B016 calling for the adoption of a human rights investment screen on Palestine and Israel. The resolution, adopted Friday, July 13, directs the Episcopal Church to follow a similar action adopted by the Evangelical Lutheran Church in America, calling for the development of criteria to screen investments based on the church’s long-held stance against human rights abuses in Palestine and Israel, for investment in the Palestinian economy, and for continued corporate engagement. This resolution passed handily in both the Episcopal House of Deputies and House of Bishops. 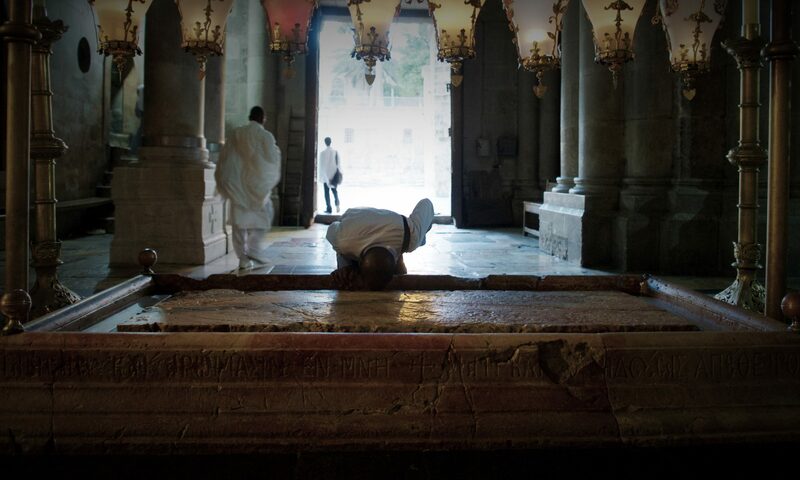 As more countries move their embassies to Jerusalem, it comes with it the perception that more nations are recognizing Jerusalem as the capital of Israel, angering world powers who do not recognize Israeli sovereignty over the Holy City. The move by the US to relocate its Israel embassy from Tel Aviv to Jerusalem has been hotly debated both before and after the dedication ceremonies, but several countries seem to have seen some merits in doing the same. Guatemala was the first to join the US embassy in Jerusalem earlier this May. Slovakia is now among the latest of a group of countries mulling the idea of having an embassy in the Holy City, an idea that has become somewhat more accepted among other countries despite intense criticism from the United Nations, as Fox News reported. Paula White, an American evangelical pastor and one of US President Donald Trump’s spiritual advisors, has voiced her support for zero tolerance regarding border laws and has stated that Jesus’ three-and-a-half year stay in Egypt did not qualify him as a refugee during an interview with CBN, published on July 9th. White preaches the “prosperity gospel,” a subset of the Christian faith popular in the United States, which advocates that donations given to the Church will come back around and make the donor richer. White was a guest of Trump at the US Embassy opening in Jerusalem. 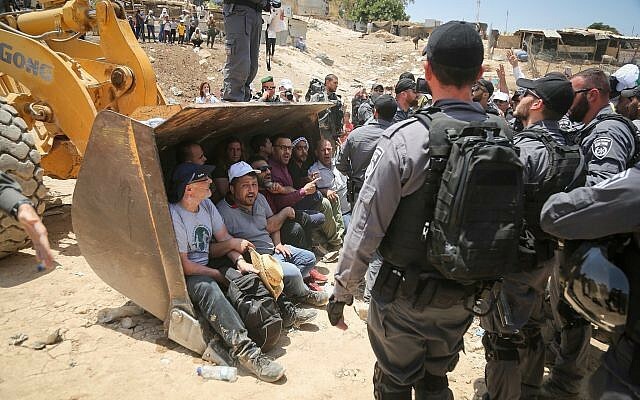 Now agriculture minister, then settler activist, Uri Ariel was already planning in the 1970’s the eviction of Bedouin living east of Jerusalem that is taking place now in Khan al-Ahmar. The document outlines a plan to turn some 100,000 to 120,000 dunams (25,000 to 30,000 acres) of Palestinian land into an area of Jewish settlement and develop it as a “Jewish corridor,” as he put it, from the coast to the Jordan River. In fact, a large part of the plan has been executed, except for the eviction of all the area’s Bedouin. The history of fifty years of land theft. Why are settlements illegal under the Geneva Convention? To ensure that a military occupation is temporary, and to allow for a resolution to the conflict, by preventing the occupying power from acquiring long-term interests through military control. To protect occupied civilians from theft of resources by the occupying power. To prohibit a de facto situation in which two groups living on the same land are subject to two different legal systems, i.e., apartheid. To prevent changes in the demographic makeup of the occupied territory. To the casual visitor or tourist driving through the occupied West Bank or Jerusalem, Israeli settlements may appear as just another set of houses on a hill. The middle-class suburban style townhouses, built fast and locked in a grid of uniform units, stand like fortified compounds, in direct contrast to the sprawling limestone Palestinian homes below. Settlement homes, mostly constructed of cement with a cosmetic limestone cladding, tend to fashion a similar look: American-style villas topped by red-tiled roofs and surrounded by lush, neatly trimmed green lawns. The largest settlement, Modi’in Illit, houses more than 64,000 Israeli Jews in the occupied West Bank. The mega-settlement has its own mayor, as well as schools, shopping malls and medical centres. Some settlements even have their own universities. Top legal body rejects the state’s response to petition from Khan al-Ahmar residents, says it will hold a hearing on Aug 15. Opponents of the demolition also argue that it is part of an effort to enable the expansion of the nearby settlement of Kfar Adumim, and to create a region of contiguous Israeli control from Jerusalem almost to the Dead Sea, a move critics say will bisect the West Bank, and make a contiguous Palestinian state impossible. The High Court of Justice agreed on Thursday to hold a hearing on a petition filed by residents of Khan al-Ahmar against the state’s decision to demolish the Bedouin village near the West Bank settlement of Ma’ale Adumim. The top legal body ordered that a hearing on the matter be held by August 15, meaning the demotion of the hamlet — originally green-lighted by the court in May — will be further delayed until after the session takes place and a decision is handed down. . . .
With the eviction appearing just days away, attorneys representing Khan al-Ahmar submitted an urgent petition last Wednesday that claimed the Civil Administration — the Defense Ministry body in charge of construction permits in the West Bank — never offered any plans to legalize the village, and refused to review a plan submitted by the villagers. . . . Without even a limited censure, the Trump administration is signaling a green light. Most residents are members of the Jahalin tribe, which the Israeli military expelled from the Negev desert of southern Israel at the start of the 1950’s. The Jahalin Bedouins were relocated to the area of Kfar Adumim in the West Bank in 1952, only to be moved again to their current location when an Israeli settlement was built there. Growing up herding sheep and goats in the hills east of Jerusalem, Eid Jahalin never expected to find himself one day lobbying in the halls of the U.S. Congress. But that is how the 51-year-old spent last week, as the small cluster of shacks he calls his home village comes under threat of demolition by Israeli bulldozers. The Bedouin village of Khan al-Ahmar, inhabited by 173 people, may seem unassuming, with homes made of wood and tarpaulin and surrounded by animal pens. But its strategic location puts it at the heart of the decades-long conflict between Israelis and Palestinians. 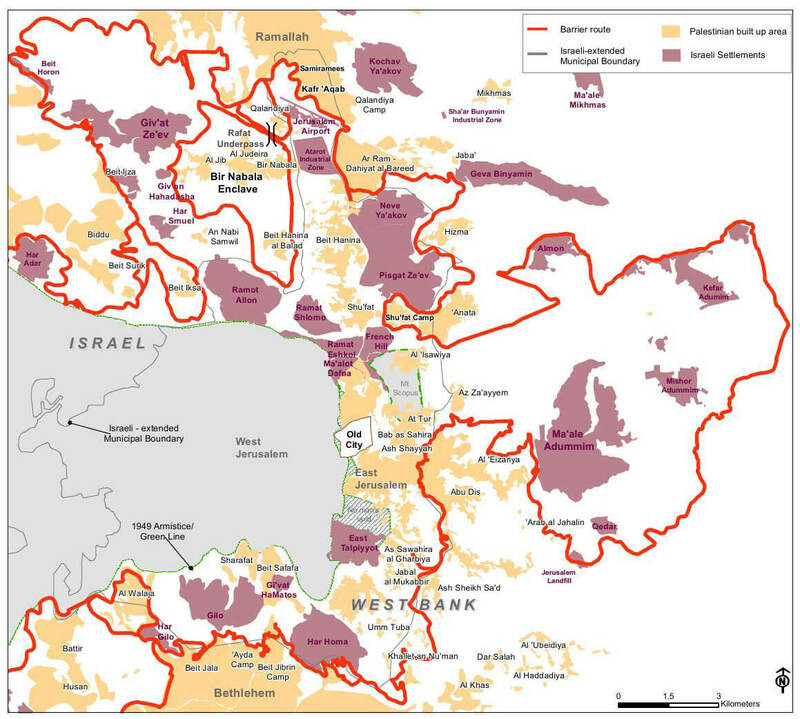 If Israel were to demolish the village and other surrounding Bedouin communities and build here as planned, Palestinian territory in the occupied West Bank would be split in two, with a portion of it isolated from any future capital in East Jerusalem. One rabbi responds to another’s criticism of Ocasio-Cortez’s statements on Israel-Palestine. As a public figure, Ocasio-Cortez responded to clear human rights abuses in a forthright and courageous manner. She deserved much more than a condescending lecture and a personal invitation to your own “nuanced” tour of Israel/Palestine. While I share your admiration for Alexandria Ocasio-Cortez’s recent victory in New York’s 14th Congressional District, I am dismayed by the heavy-handed way you chose to convey your congratulations. I’m referring to your open letter to her (Jewish Journal, 7/4/18) in which you expressed your concern that her public statements about Israel and Palestine indicated a “less than nuanced perspective” and invited her to join you on a tour of the region. This is a massacre. I hope my peers have the moral courage to call it such. No state or entity is absolved of mass shootings of protesters. There is no justification. Palestinian people deserve basic human dignity, as anyone else. Democrats can’t be silent about this anymore. An Irish bill on Israeli settlement goods could make history. This is not an “extreme” or “radical” measure, as some have claimed. It simply identifies settler-made products for what they are: illegal. These products are made on stolen land with stolen resources. On July 11, the upper house of the Irish parliament, the Seanad, will vote on a landmark bill that, if passed, would ban the purchase of goods and services from illegal Israeli settlements. The “Control of Economic Activity (Occupied Territories) Bill 2018” was put forward by Irish independent Senator Frances Black and co-signed by Senators Alice-Mary Higgins, Lynn Ruane, Colette Kelleher, John G Dolan, Grace O’Sullivan and David Norrison on January 24 this year. However, just six days later, the Seanad voted to delay the debate on it indefinitely after Israel protested. On January 30, Israeli Prime Minister Benjamin Netanyahu summoned the Irish ambassador to Israel, Alison Kelly, who explained that the Irish government did not support the bill. Netanyahu had claimed the bill sought to “harm the state of Israel” and was an attempt to support the Boycott, Divestment and Sanctions (BDS) movement. Six months later, on June 27, Black announced that on Twitter that the proposed law is back on the schedule for a debate in the Seanad. 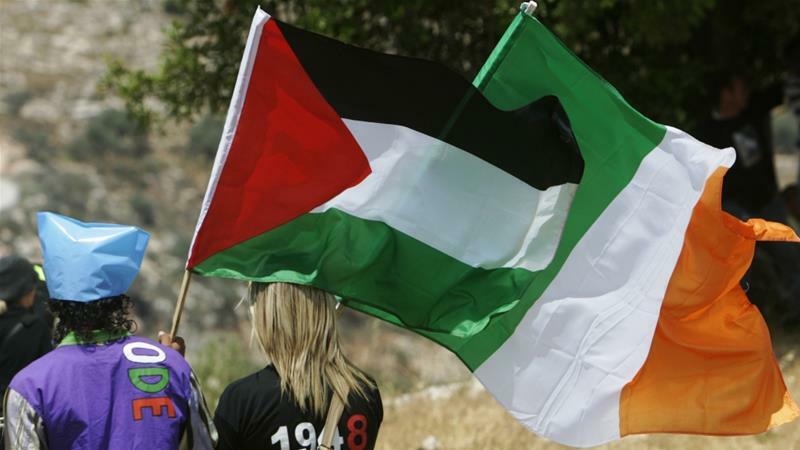 And just a week later, Fianna Fail (Warriors of Fal), the second-largest party in the Irish parliament, declared that it was going to back the bill, raising hopes among Palestine supporters in Ireland that it would indeed pass.